Departing from Adelaide, discover the best of Papua New Guinea over 21 nights aboard Sun Princess. 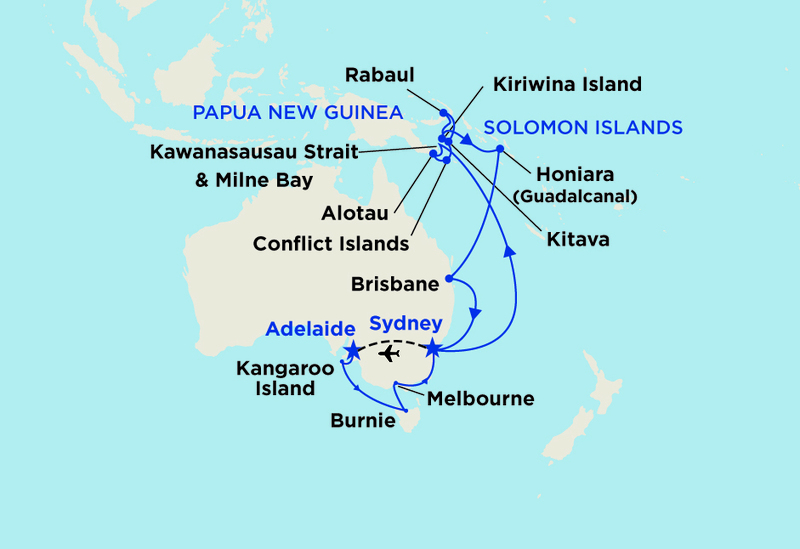 Visit a number of enticing ports including Kangaroo Island, Burnie, Alotau, volcanic Rabaul and the Conflict Islands. Learn about the local culture and traditions on Kiriwina Island. Enjoy the relaxed island vibes and white sandy beaches with plenty of opportunity for exploring. Package includes flight home from Sydney to Adelaide. Cruise departs 15 March 2020. For a completely authentic experience, nothing beats Papua New Guinea. You will be hard-pressed not to embrace the island vibe and culture as the delightful locals welcome you to their country. Alotau is the capital of Milne Bay Province, in the south-east of Papua New Guinea. Kiriwina Island is part of the Trobriand Islands, an archipelago of coral atolls off the eastern coast of New Guinea. With a history more chequered than a flag, Rabaul and the rest of New Guinea at one time fell firstly under the British as British New Guinea, then under the Germans as Kaiser-Wilhelmsland. Then the Aussies arrived and the place became the Territory of Papua and New Guinea. The Japanese captured much of New Guinea including Rabaul during WWII. Finally, at Independence in 1975, the land became Papua New Guinea. History lesson over with, Rabaul - proclaimed one of the prettiest towns in the South Pacific, was a very lively town that supported a population of 30,000 including some 2000 expatriates. Until 1994, everyone lived on tenterhooks with daily earthquakes known locally as a ‘guria’ and that one of the 7 volcanoes surrounding the town would one day blow Krakatoa-style…Rabaul was decimated by a volcanic eruption in 1994. A legacy of Rabaul being situated atop the Pacific Ring of Fire is it’s beautiful harbor – an extinct caldera of known as Simpson Harbor, ringed by still-active volcanoes - notably Vulcan and Tavurvur – the two responsible Rabaul’s partial demise. Simpson Harbor is big enough to accommodate the Queen Mary2 and was one of the reasons why Rabaul was eyed off by the Japanese. They loved the harbor and used it as a naval base. At the bottom of the harbor lie some Japanese and Allied war wrecks. Even one of Rabaul’s wharfs, just adjacent to where Princess and other cruises pull up, is a sunken wreck since converted into a wharf! Interesting shore excursions offer touring to volcanically active sections of the Rabaul coast and it's still-operational Rabaul Vulcanological Observatory - where important work is done to keep tabs of the daily seismological, as well as volcanic activity. Rabaul was also scene of heavy fighting and the Japanese – Pacific Occupation in WWII. A legacy of this time are some 500km of Japanese war tunnels hewn into the porous volcanic rock, along with war relics dotted along the coast and in the shallows. The New Guinea Club, originally built by Nobby Clark pre-war in 1933 was a businessmen’s club with strict guidelines for membership, although that didn't prevent a young Errol Flynn from charming his way in. It was badly damaged in WWII and rebuilt in the 1940s to its former glory, where it then became a members club for the expatriate population. It was destroyed again during the volcanic eruption of 1994. Now partially restored again, the club is now home to a small and interesting museum, and a bar that opens periodically. Just across the road is Admiral Yamamoto’s bunker, where inside is a modest collection of wartime artefacts. Yamamoto was the architect of the Bombing of Pearl Harbor. He was eventually shot down over Bougainville. Little beaches such as Pila Pila, Tovarua and Takubar offer gentle respite and good snorkelling, as well as SCUBA diving opportunities. Kulau Lodge - located 12km from Rabaul port offers a r esort-style atmosphere, lunch and opportunity to swim at the beach. The new township - Kokopo - located 29km south of Rabaul port, offers a small township. The Ralum Club is is located at the location where Queen Emma's residence once stood. Today, it is a good place for a cool drink at the bar's veranda. Further, Rapopo Plantation Resort offers resort facilities including a restaurant, swimming beach and dive/snorkel facilities. And for those wishing to pay their respects to the Fallen, Bita Paka – a Commonwealth War Graves Cemetery is a beautifully kept memorial to the Commonwealth war dead, many of whom perished during Rabaul’s fall to the Japanese. If travelling on a Hosted Cruise, included home to airport transfer is for the Adelaide metropolitan area to the value of $80 per booking and only applicable if booking your airfares through Phil Hoffmann Travel.